There are two important writers concerning the contamination of Canada by Communism. One is Allan Stang, and the other is Robert Rumilly. In 1956, fifteen years before Allan Stang published CANADA – How The Communists Took Control, French Quebec historian, Robert Rumilly, intercepted and documented the very same ring of Communists as they were setting up shop in Quebec. Rumilly published the results of his investigation in French under the title L’Infiltration gauchiste au Canada français (The Leftist Infiltration in French Canada). Rumilly’s work adds new facts and names to those disclosed by Stang, such as Le Devoir newspaper editor, André Laurendeau, and the Institut canadien des affaires publiques (Can­a­di­an In­sti­tute of Pub­lic Af­fairs). At the same time, many of those known to Stang appear in Rumilly’s pages, such as Pierre Elliott Trudeau, Jean-Louis Gagnon. I am giving you all that I have translated so far of Rumilly’s “Notebook No. 1“, which I am gradually putting into English in the form of a web site dedicated to Rumilly’s work on the communist infiltration of Canada. I will notify you of the launch. The goal of that Web site (as of this short English extract of a couple of chapters, featured here) is to provide you with the opportunity to become acquainted with certain classics of Quebec history which are not well known today, but deserve to be. 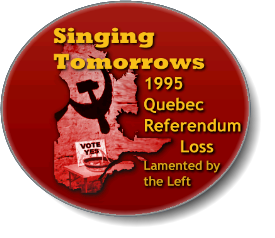 Towards the end of the 1940s and during the 1950s in Quebec, a pro-Soviet Leftist movement began to be detected. Historian, Robert Rumilly, in his L’Infiltration Gau­chiste au Canada Français (The Leftist Infiltration in French Canada), documented this activity and identified the network which had installed itself in Canada, in particular in its main target, Quebec. Rumilly shows how the partisans of that movement sought to emulate a similar Left in France which had concentrated around Emmanuel Mounier and his crypto-communist review, Esprit. Esprit’s first issue in 1932 favorably describes a voyage behind the Iron Curtain into Soviet Russia. Wrting in 1956, Rumilly deplores the ideology of “Catholicism of the Left” which Esprit and other sources had fostered to divide the Catholic Church in France into antagonistic camps. Rumilly above all identified the small ring of individuals at the core of the movement, and the organizations they erected, or infiltrated, to create the impression of a vast social crusade. As well, he exposed the participation of the federal level of Canada, whose national broadcasting network, CBC-Radio Canada, promptly employed the Leftists in Quebec. It kept them salaried while providing a near-exclusive platform to broadcast their ideology without opposition. As well, Rumilly noted that the tendency of communism to cen­tra­li­ze threatened the very existence of the French Canadians, whose cultural survival in North America depends upon provincial autonomy in Canadian federalism. In fact, Rumilly was right. In the April 1962 issue of Cité Libre, Pierre Elliott Trudeau — a principal ar­chi­tec­t of the pro-Soviet network, along with others such as Le Devoir editor André Laurendeau — demands a “new constitution” to create a polyethnic Canada, apparently dominated by Asians and Africans. 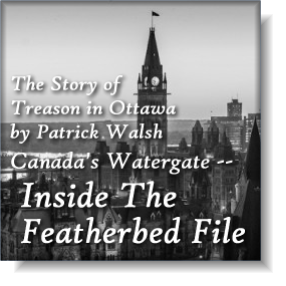 Trudeau’s “New Treason of the Clerics” is a must-read. He begins it with an apt quotation, making “treason” the crime of fidelity to the nation. In that article, Trudeau expressly demands the reduction of the “Britanno” Canadians to a strict minority on their own soil. He even envisages the future disappearance of the French Canadians! In other words, his plan for Canada is literally the genocide of its founding peoples, both French and English speaking. When he published L’Infiltration in 1956, Mr. Rumilly, born in 1897, was an accomplished and respectable author of works of history and non-fiction, well connected to the clergy and active in local politics. His glimpses of the precipitous workings of the Leftist ring and their clandestine infiltration of French Canada is an invaluable contribution to the history of Canada. In his second book on this theme, The Leftist Tactic Unmasked (which I hope to be able to translate one day) — the sequel and complement to his L’Infiltration — Mr. Rumilly shares with us the correspondence he received, and the reactions unleashed among these same individuals whose ring Rumilly had just exposed, being set up under the public’s radar. A perspicacious man who gives a strong impression of integrity and good faith, Rumilly knows how to fight with facts and pen. He is an ardent defender of Quebec and the French Canadians. He is an historian not simply of the past, but of events happening before his eyes, events other authors simply missed, even after the fact… and perhaps by no coincidence. I give you Mr. Robert Rumilly in my own exclusive English translation. Nota bene: I hold the copyright to my English translation of Rumilly. KM. — The review Esprit — The result. For a certain number of years now, there ex­ist in France “Cath­o­lics of the Left” or “Chris­tian pro­gres­sives” who know no en­e­mies on the Left. The large Eng­lish Cath­o­lic week­ly mag­a­zine, The Tablet, an­nounced and stud­ied this move­ment — with some alarm — in its is­sues of March 10th and March 17th, 1956. The “Catholics of the Left” exhibit their fist to the right, the side where the vast ma­jor­i­ty of Cath­o­lics are, but shake hands with the Com­mu­nists, to­wards whom they are all-ac­com­mo­dat­ing. At their dis­pos­al is a real and pow­er­ful press trust, main­ly con­trolled by Mrs. Ella-Blanche Sau­va­geot of per­i­od­i­cals such as Es­prit* and Tém­oig­nage Chré­tien**; and fi­nal­ly the sup­port of the French Do­min­i­cans, who pub­lish La Vie In­tel­lec­tu­elle***. A leader of this group, The Dominican, Reverend Father Avril, is obliged to admit in Témoignage Chrétien on No­vem­ber 18th, 1955: “There is no doubt that the ma­jor­i­ty of Cath­o­lics are clas­si­fied as po­lit­i­cally on the right.” He might as well also write that men of the right are, in their very great ma­jor­i­ty, Cath­o­lics. How­ever, the “Catholics of the Left” devote themselves exclusively to the fight against this ma­jor­i­ty of Catholics, whom they treat as enemies. Far from fighting the anti-cath­o­lic par­ties, they are com­bined with the rad­i­cal party and with the so­cial­ist party­ — polit­i­cal ex­pres­sions of free­masonry — and even with the Com­mu­nist Party, which are sys­te­mat­i­cally and vi­o­lent­ly anti-religious. The “Catholics of the Left”, on the mod­el of the Com­mu­nists, read­i­ly treat men of the right as “fas­cists”. They fur­i­ous­ly attack all French Cath­o­lics who fol­lowed mar­shal Pétain­ — all French Cath­o­lics who are not of their chapel. They thus ser­i­ously di­vide the Cath­o­lics –– de­spite calls by Pius XII for har­mony among Catholics. And they have the same ad­ver­sar­ies — the same enemies! ­– as the Com­mu­nists, which leads them into sym­pathy, even into strict al­li­ance. as an avant-garde which it will undoubtedly be necessary to join before long. At most, they deplore some “regrettable ex­ces­ses” of Com­mu­nism – and their at­ti­tude is in formal con­tra­dic­tion to that of Pius XI, who con­dem­ned Com­mu­nism as “in­trins­ic­al­ly per­verse”. There might un­for­tu­nate­ly be a small dose of er­ror in Com­mu­nism, but also ex­cel­lent things which it is ad­vis­able to know and ap­pro­pri­ate to adopt as a start­ing point. This kind of Marxist philosophy is pen­e­trat­ing into cer­tain Cath­o­lic mil­ieux. The Su­preme Con­gre­ga­tion of the Holy Of­fice decided, on July 1st, 1949, that it is not per­mit­ted to pub­lish, dis­trib­ute or read books, re­views, news­pa­pers or loose leaves which sup­port the doc­trines or the ac­tion of the Com­mu­nists, nor to write for these pub­li­ca­tions. Thus, Cath­o­lics have no di­rect means to know Com­mu­nist prop­a­ganda and to ab­sorb it. The lead­ers and the bodies of “Cath­ol­i­cism of the Left” fill this gap. They main­tain an at­mos­phere of non-re­sist­ance. On Sep­tem­ber 14th, 1945, Té­moig­nage Chré­tien wrote: “The front of the an­ti­com­mu­nist fight will not have us.” And non-re­sist­ance soon trans­forms it­self into ben­ev­o­lence, an “under­standing” which paves the way for col­lab­o­ra­tion, or worse still. I would add: “Why does the senti­ment of broth­er­hood felt to­wards the Com­mu­nists not ex­tend to the French, the great ma­jor­i­ty of whom are Cath­o­lics, and who ven­er­a­ted and fol­lowed mar­shal Pétain? would be right to think he did not dis­par­age Com­mu­nism while he was there. He des­cribed the U.S.S.R. as “an im­mense school” and “a vast con­struc­tion site”. And also “a for­mid­able camp”, but be­cause the So­vi­et Un­ion, deep­ly at­tached to peace, fears at­tack by the “cap­i­tal­ist pow­ers” it must con­se­quent­ly be ready to “de­fend the school and the con­struc­tion site”. 1 — From the economic point of view, the So­vi­et ex­per­i­ment con­sti­tutes a suc­cess, es­pe­cial­ly if one wants to take good ac­count that over thir­ty-five years, the U.S.S.R. has had to sup­port two wars: one from 1918 to 1922 and the sec­ond from 1941 to 1945. 2 — The Soviet Union exerts very great efforts to spread cul­ture among its peo­ple, and these ef­forts are crowned with suc­cess. This does not im­ply that So­vi­et cul­ture, in it­self, is sat­is­fac­tory. 3 — It appears that the Soviet people are be­hind their gov­ern­ment and one does not see, more­over, how it could be oth­er­wise with the sys­tem of edu­ca­tion and prop­a­ganda which func­tions over there. Pro­por­tion­ing is seen: one tea­spoon­ful of res­er­va­tion to three soup-spoons of praise. Cer­tain­ly not a straight-out apol­ogy for the So­vi­et mode, but an ac­cent a­droit­ly and con­stant­ly placed on the achieve­ments, the suc­ces­ses. Over­all, a very sym­pa­thet­ic, very fa­vor­able im­pres­sion. Mar­cel Clé­ment can write (in Notre Temps*, Feb­ru­a­ry 14th, 1953): “This let­ter of Mr. Ma­daule, it is, in a very pre­cise sense, the Trojan Horse in the pre­cinct of the Church. At the time of this writ­ing, it has be­gun to in­ject the poi­son it con­tains into thou­sands of minds….” And Mar­cel Poim­bœuf, in L’Homme Nou­veau**, can call Jacques Ma­daule “a vol­un­tary agent of So­vi­et prop­a­ganda”. party, against the prohibition of a communist demonstration in 1952. And so on. Mrs. Sauvageot is not the only one. Along with her, Mrs. Genevieve Clairvoix (La Quinzaine), Georges Montaron (Témoignage Chrétien) and Jean-Marie Do­men­ach (Esprit) signed the pro­test­a­tion, pub­lished in L’Hu­ma­ni­té, against the pro­hi­bi­tion of a com­mu­nist dem­on­stra­tion. Nei­ther Mrs. Sau­va­geot nor her col­leagues, sig­na­tor­ies of sev­er­al proc­la­ma­tions in­spired by the Com­mu­nist par­ty and in­sert­ed in L’Hu­ma­ni­té, ev­er once af­fixed their sig­na­tures to the bot­tom of a pe­ti­tion re­ject­ed by the Com­mu­nist par­ty. The “Cath­o­lics of the Left” raised their voice in fa­vor of the Rosen­berg spies, con­demned to death in the Unit­ed States. They de­clared odi­ous the wait of sev­er­al weeks which was in­flict­ed upon them (pend­ing news of) grace or the e­lec­tric chair. How­ev­er, at that same time, two anti-com­mu­nist mil­i­tants of the Pé­tain re­gime, con­demned to death on No­vem­ber 18th, 1949, were locked up in the cell on death row at Fort Hâ. They were al­so await­ing grace or ex­e­cu­tion. The mil­i­ti­amen were shot in Bor­deaux on June 2nd, 1953, after a wait of not a few weeks, but forty months — which by no means moved the “Cath­o­lics of the Left” or the “Chris­tian pro­gres­sives”. And Mr. Julien Brunhes, independent sen­a­tor of the Seine, could de­plore that in the mu­nic­i­pal elec­tions of 1953 “un­ex­pect­ed sup­port was brought to the Com­mu­nists by Cath­o­lics and even by priests who en­cour­aged vot­ing Com­mu­nist rath­er than for mil­i­tant Cath­o­lics, con­sid­ered as re­ac­tion­ar­ies”. An organ of the “Catholics of the Left”, the re­view Esprit de­serves spe­cif­ic ex­am­i­na­tion be­cause of the in­flu­ence which it has ex­ert­ed in French Can­a­da, as we will see fur­ther on. This ex­am­i­na­tion will more­over con­sti­tute an ex­cel­lent il­lus­tra­tion of all that pre­cedes. Esprit was founded by Emmanuel Mounier in Oc­to­ber 1932. In its first is­sue, an ac­count is pub­lished of a voy­age in Rus­sia, all to the ad­van­tage of the So­vi­ets. In So­vi­et Rus­sia, one breathes “much bet­ter than else­where”. Even the faces of the cit­i­zens do not ap­pear to be “un­in­ter­est­ing, stunned, id­i­ot­ic like the ma­jor­ity of our own”, but alive, an­i­mat­ed by an in­ter­ior fire. It em­a­nates “a dom­i­nant feel­ing of free­dom”. Translator’s note: This chapter on Esprit is extremely important because Pierre Elliott Trudeau’s pro-communist Cité Libre magazine modeled itself on Esprit. Esprit was implementing tactics to destroy the Catholic Church in France. Cité Libre calls itself the “little sister” of Esprit. Esprit is crypto-communist, claiming to be “Catholic socialist”; however, the term appears to be self-contradictory, as Catholicism is a spiritual world-view, and socialism a materialist. Esprit, as I recently found out, is favorably mentioned in a PDF file inside Rockefeller’s Trilateral Commission web site. Of course, the Rockefellers through their Chase Manhattan bank were instrumental in the Bolshevik Revolution and the Sovietization of Russia. Trilateral’s Peter Sutherland refers to the founders of Esprit as “Catholic socialists”. Rockefeller’s Trilateral Commission has been pushing regional union in North America. Meanwhile, Esprit has for decades been pushing regional union in Europe. In North America, the French Canadians in Quebec were the major barrier to regional union. Their language and their Catholic faith and Quebec’s confessional school system are guaranteed in the lawful constitution of 1867, the British North America Act. However, to begin the regional harmonization, Quebec’s Catholic institutions and public education system had to be destroyed and replaced with secular institutions; otherwise, hundreds of new racial groups could not be mass immigrated onto Quebec soil, there being no public schools for them. This may be why the merger was begun with Catholic Italians who could fit into the original confessional system. The Catholic Church in Quebec has indeed been decimated; in 1965, the educational system was handed over to secular authorities by associates of this very same ring of Leftists exposed by Rumilly. Today, one may read in the various tabloids of the rash of conversions of Catholic Church buildings to condominiums and other uses. Montreal, which had once been known as the “City of a thousand bells” in reference to its Church steeples, hears bells rarely, but the signs are bristling up everywhere of mosques and temples. With the hijacking of the confessional public school system (Catholic and Protestant, i.e., belonging to the Founding Peoples of Canada), massive rates of foreign immigration to Canada have been underway in the name of globalism. (There are now over 135 “mother tongues” in the district where I live, Côte-des-Neiges, which 30 years ago, was a French and English neighborhood.) KM. this growth while the oldest and best established reviews have a hard time surviving? As of No­vem­ber 1934, Les É­tu­des, a re­view of the Jes­u­it Fath­ers, puts Cath­o­lics on guard against the doc­trines fol­lowed and prop­a­gated by Esprit. It is more­over suf­fi­cient to thumb through the Es­prit col­lec­tion to see just how far its de­sire goes for col­lab­o­ra­tion with the most ex­treme Left. Let’s be­gin with the is­sues pub­lished after the war’s eclipse and the oc­cu­pa­tion. We saw that in Sep­tem­ber 1945, Té­moig­nage Chré­tien re­fused to take part in a po­ten­tial anti­com­mu­nist front. Esprit had pre­ced­ed its fel­low-mem­ber by writ­ing in June: “Let us say it plain­ly. In no case and un­der no pre­text will we par­ti­ci­pate in any kind of anti­com­mu­nist front: anti­com­mu­nism is trea­son, de­clared or vir­tual.” And the pé­tain­ists and oth­er ad­ver­sar­ies of Com­mu­nism are, ef­fec­tive­ly, treated like trai­tors. Esprit de­plores that Charles Maur­ras is simp­ly sent to the pe­nal col­ony, and not shot. And it re­proach­es the bish­ops for hav­ing fol­lowed the Pé­tain gov­ern­ment and re­grets that the Church of France did not pur­i­fy it­self — in other words, that she did not seek the rev­o­ca­tion or the con­dem­na­tion of the bish­ops and the Pé­tain­ist priests. Translator’s note: “anti­com­mu­nism is trea­son” – Sounds like Pierre Elliott Trudeau in the April 1962 issue of Cité Libre. He makes it clear from the outset of his article, “The New Treason of the Clerics” that fidelity to the nation is “treason”. In other words, a total inversion of values. It also would seem to be a tactic. I have noted that when Marxist-Machiavellian Trudeau tells you to do something to preserve yourself, and you do it, you will instead destroy yourself. But he will tell you that whatever you are to do, it is essential to your survival. doing anything in France against or with­out the Com­mu­nists.” No doubt, in this col­lab­o­ra­tion, one will be sub­ject to some in­flu­ence of the Com­mu­nists. Esprit only hopes that the Com­mu­nists will want to al­low them­selves to be in­flu­enced as well, to ar­rive at “a hu­man­ist­ic Com­mu­nism to which we all will sub­scribe”. An article of August 1945 dis­cus­ses the “cur­rent ne­cess­ity for Com­mu­nism”. In Oc­to­ber 1946, even the di­rec­tor of the re­view writes that a Chris­tian can adopt the ma­jor­i­ty of the po­lit­i­cal po­si­tions of Com­mu­nism and con­clude al­li­an­ces with it. It is enough to be vig­i­lant “on threat­en­ed points”. The ar­ticle re­proaches a clergy­man for his anti­com­mu­nist judg­ments, which de­rive from “the most con­test­able phil­os­o­phy of his­tory and un­doubt­ed­ly the most clear­ly out­dated by the dom­i­nant per­spec­tives of the post-war world.” It is the Com­mu­nist the­ory, ac­cord­ing to which the world moves fa­tal­ly — and happily — to­wards the So­vi­et re­gime, so that while plac­ing one­self on the Left one acts “in the di­rec­tion of his­tory”. Capitalism is condemned to death and well knows it… Triumphant American cap­i­tal­ism has a guilty conscience, the bour­geois­ie through­out the whole world has a guilty con­science and is afraid. Com­mu­nism does not need war to de­vel­op, be­cause time works for it. *For my post on a similar “debate” here in Quebec, see “Crucifix in the Quebec Legislature is Constitutionally Protected“. right”, including and above all the most Cath­o­lic, are en­sconced in the same aver­sion, not to men­tion the same hat­red. An ar­ticle of March 1948 rid­i­cules the Al­phon­si­enne book store of Sainte-Anne-de-Beaupré, which pub­lished a bro­chure fav­or­able to Franco. And Sal­a­zar is in no way spared. The fol­low­ing month, Esprit de­nounces re­ports in the anti­com­mu­nist press and “to con­sole our­selves” it points to the “cour­a­geous cam­paign” of the com­mu­nist pa­per, Franc-Tireur. All in all, according to Mounier, the Church on­ly con­demns the ex­ag­ger­a­tions, the de­for­ma­tions of Com­mu­nism — of Com­mu­nism which, as he lets it be known con­trary to Pius XI, is in­trins­ic­al­ly good. We could continue. Let us continue. Al­bert Béguin suc­ceed­ed to Em­man­u­el Moun­ier, and Jean-Marie Do­men­ach was lat­er the as­sist­ant to Al­bert Bé­guin, di­rect­or of the re­view Es­prit. Bé­guin was as far to the left as was Moun­ier; and Do­men­ach even fur­ther, if that is pos­sible. cially interested to the collection of this review, and to say to the others that Esprit has not ceased to invite “Catholics of the Left” to hatred, but a svelte, refined, polished hatred against the Pétainists, the traditionalists and other men of the right, and to a sympathy, even to collaboration with respect to Communism, which contains, does it not, “numerous political, economic, social and human truths”. Let’s take a recent issue. In March, 1956, an editor of Esprit writes that we must “far better come to terms with the discoveries of Marxism than condemn them”. Must not “the truth be recognized everywhere it is found” — provided it is found to the Left ! Témoignage Chrétien in the barracks in October 1955, so much had it undermined the morale of recruits. An eminent Dominican, Father Vincent Ducatillon, who himself had play­ed with fire but had re­gained his hold on him­self, came to ack­nowl­edge in La Croix (May 29th, 1956) that there ex­ists a cri­sis of pa­tri­ot­ism with­in French Cath­ol­i­cism, that this cri­sis is one of the most acute and the most ser­i­ous of the pres­ent time, and that it is due to the in­flu­ence of trends such as Marx­ism, work­ing on those “who like to con­sid­er them­selves the activist/militant wing of the Church”. more serious still is that these vic­tims be­come, in the very heart of the Church, the ac­com­pli­ces of the Ad­ver­sary. A part of the press is vis­ib­ly taint­ed by the poi­son. Were we not dev­a­stat­ed to see with what alac­ri­ty, with what con­tempt for the truth, cer­tain pap­ers or re­views which pur­port to be Cath­o­lic spoke about the per­se­cu­tion in China? The Church is al­ways wrong; on­ly the “Marx­ist truth” on events be­hind the Iron Cur­tain is wor­thy of cred­it. “Can we remain indifferent or content ourselves with sterile moanings? No. We will not be “dumb dogs”. Let us go on to precise examples. In the stu­dent move­ment stud­ied, in France, the mem­bers of the J.O.C. (Cath­o­lic Stu­dent Youth), open­ly treat Cath­o­lics of the right as en­e­mies and the Com­mu­nists as al­lies. They sys­te­mat­ic­al­ly adopt all the po­si­tions of the Com­mu­nist par­ty. So much so that one can re­gard the Cath­o­lic Stu­dent Youth as the aux­il­iary, al­most the ap­pen­dage, of the Com­mu­nist Stu­dent Youth. The lead­ers of the J.E.C re­fused to join the pro­tests against per­se­cu­tions of priests pre­vailing be­hind the Iron Cur­tain. The re­sult is that no Com­mu­nist stu­dent con­verts to Cath­o­li­cism, where­as Cath­o­lic stu­dents slide into Com­mu­nism. All of that clar­i­fies the un­happy af­fair of the worker-priests. an inordinate number of them slipped into Communism. Some defrocked. The episcopate, then the Holy See, in­ter­vened to stop an ex­per­i­ment which had turned to di­sas­ter. However, the Roman decisions were not at all well received by the “left” Catholic press. As of the first warning state­ment from the Holy See, which resembled a judgment, a Dominican, Father Yves Cougar, published in Témoignage Chrétien an apology by the organization of worker-priests which resembled a protest — oh, so eruditely shrouded — against the Roman decisions. It is known that 73 worker-priests went as far as open revolt against the decisions of the Holy See. Who would dare to claim that the encouragement of the “left Catholic” press did not call forth, did not provoke this rebellion? vanizers of the leftist movement, as we have said. There are, in the Or­der of Saint-Dom­i­ni­que in France, what would be called in the Uni­ted States, “fel­low trav­el­ers” of Com­mu­nism. One finds the com­mu­nist vo­cab­u­lary in their texts. (See above: “the strug­gle of the pro­le­tar­i­at for its lib­er­a­tion”.) Fath­er Che­nu, for ex­am­ple, col­­la­b­o­r­at­ed in bod­ies with com­mu­nist sym­pa­thies, ad­hered to com­mu­nist or­ga­ni­za­tions, signed proc­la­ma­tions and took part in com­mu­nist dem­on­stra­tions. In one case, com­mu­nists who had pro­voked bloody brawls in the na­tion­al­ized fac­tor­ies of Re­nault were laid off. The Party or­gan­ized a pro­test in their be­half. Fa­ther Che­nu went and spoke: “I come with joy to bear wit­ness be­fore you of my ac­tive sym­pa­thy…” (L’Hu­ma­ni­té, 14 March 1952). One may say of him, as of Ma­dame Sau­va­geot, as of all the lead­ers of “Cath­ol­i­cism of the left”, that he nev­er signed a text or took part in a pro­test dis­a­gree­able to the com­mu­nists. worker-priests tends, also, to give the impression that Rome is always wrong. The “Catholics of the left” thus became the habitual allies of all that is anticlerical, of everything materialistic, of all that is Masonic or Freemasonic in France. They joined with the worst of the anticlericals to fight the Barangé bill, which en­deavoured to grant a minimum of educational justice to the Catholics. A special issue of Esprit served as an effective wea­pon for the adversaries of this Bill. It is a fashion in these milieux to strike an attitude of an­ti­cler­ic­al­ism. The Reverend Dominican Fathers, on the whole, on their own account, take up the old war cry of the Free­masons: “Clericalism, here is the enemy.” Isn’t that clever of the monks? Cité Libre – The Complete Network – Radio-Canada. “I often met Dom Flicoteaux, either at the Benedictine abbey of Sainte-Marie, or again at my office. This man of prayer and meditation followed with pained astonishment the doctrinal evolution of certain French-Canadian groups. He saw here the direct and deleterious influence of France’s leftists and pro­gres­sives. He constantly warned me against French schools well-known for their advanced ideas and their so­cial­ist and communist sympathies. The influence of the “Catholics of the left” has indeed radiated in French Canada. Canadian students in Europe are flanked by the group from Esprit, and if they do not have a strong foundation, they are indoctrinated and denationalized. A men­tal­i­ty of contempt and hatred is inculcated, along with rev­o­lu­tion­ary ambitions and confused ideas in which class struggle plays a great part. Translator’s note: “Cité Libre” — Our controlled press up here rarely refer to it; when they do, they call it a “federal-ist” magazine, in order to seem to link its co-founder (prime minister) TRUDEAU with a PRO-CANADA stance. In fact, Cité Libre’s federal-ism is globalism, regionalism, multiculturalism, polyethnic pluralism, anything which erases national boundaries and existing national peoples. It is a regionalizing federal-ism for which TRUDEAU stands and for which Cité Libre stands. And the trickery of the press, other authors and media, when they do mention it, is deliberate. They can’t fail to know that Cité Libre is pushing denationalization and regional federal-ism, NOT CANADIAN CONFEDERATION. Abbot J.- B. Desrosiers observes: “This short passage in sub­stance contains Communism, because it unsettles the so­cial order.” (Nos Cours, January 10th, 1953). The “great currents of thought” that our education is wrong not to offer for the study and ad­mi­ra­tion of students are, ap­par­ently, Communism and existentialism. Le Devoir grants high marks to Cité Libre as it does to Esprit, copiously quotes from it and lavishes praise upon it. How­ever, in spite of these “shock doctrines” and these en­cour­age­ments, Cité Libre had achieved only a limited readership when Esprit gave the group a leg-up in the form of a special issue devoted to French Canada (August-Sep­tem­ber 1952). The foreword to the issue is by Henri-Irénée Marrou, a pro­fes­sor of history at the Sor­bon­ne and a “Cath­o­lic of the left” of the most mil­i­tant va­ri­e­ty. Translator’s note: “true culture” – this is a trick of the Leftists. If you think we don’t have “true culture”, show me an example of “true culture” and tell me how you know it’s “true” in comparison to all else. In effect, is there even such a thing as “true” culture? Trudeau, in Cité Libre, plays the same game with “true federal-ISM”, pretending that there is an ideal platonic model of “federal-ISM” to which everyone must aspire, and therefore absolutely must destroy their own country to achieve it. Show me “true” federal-ISM. Is there such a thing as “true federal-ISM”? I think not. But the statement is effective at misleading. 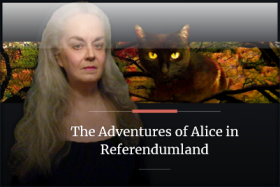 As in Alice in Wonderland, it sounds like proper English, but it doesn’t MEAN anything. However, the trick, if you fall for it, will have you skipping and hopping merrily behind the Marxist Pied Piper to your doom. H.-I. Marrou resigned from UNESCO, where he had been one of France’s rep­re­sent­a­tives, to pro­test against the ad­mis­sion of Spain. This “Cath­o­lic of the left” is thus quite typ­i­cal: the pres­ence of Marx­ist Rus­sia seems to him en­tire­ly na­tur­al, but that of Cath­o­lic Spain pre­vents him from sleep­ing. Other than the foreword, the issue is writ­ten en­tire­ly by French Can­a­di­ans, with the ex­cep­tion — symp­to­mat­ic, as we shall see later — of Frank R. Scott. Translator’s note: “Frank R. Scott” — Frank Scott, was not only a constitutional scholar known as a strict constitutionalist, but unfortunately a Rhodes Scholar. It turns out Scott is working for socialism and world government. He recruited people such as Pierre Elliott Trudeau to the cause. 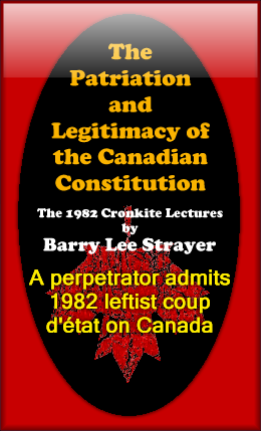 The principal draftsman of Canada’s coup constitution of 1982 (Barry Lee Strayer) was also Scott’s recruit. One of Scott’s best friends, Bora Laskin, was made the first Jewish Chief Justice of the Supreme Court of Canada by Trudeau, over the head of the man entitled to the post. By 2011, Canada had a staggering four Jews on the Supreme Court; one has dropped off, we now have three. How does this benefit the cultural interests of the Founding Peoples of Canada to have a third to a quarter of our final judgments on constitutional issues determined by a tiny minority race that had nothing to do with founding the country? Give me a head count, please. How many English, Irish, Scottish, French-Canadians are there on the Supreme Court of Israel, an ethnic nation of and for Jews? What, none? I rest my case. Canada is an ethnic state of its own founding peoples; there are no Jewish legislatures here. 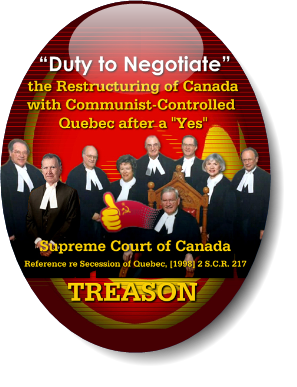 Yet Laskin was pushed to the top to preside at the “patriation reference” of 1980-81, part of a front contrived to impose Trudeau’s coup constitution, which harmonized Canada with the Charter of the UN (future world government), while suppressing our lawful Parliament and Legislatures. As for Barry Lee Strayer, who apparently had dual citizenship, as a young lawyer, he worked in the Roosevelt “New Deal” administration defending what he calls “innovative legislation” against the United States Supreme Court, which struck it down. Apparently Jewish Strayer failed in America; he then came to Canada and overthrew our lawful Constitution in conspiracy with Trudeau, Scott and others. Part of Strayer’s education (at Oxford) was funded by a Mackenzie-King traveling scholarship, which is none other than a J.D. Rockefeller endowment. That’s the fellow who called in the U.S. National Guard to shoot his own striking employees who were paid subsistence and treated like slaves. depict the considerable role — read: ‘the ex­ces­sive role’ — of the cler­gy in the prov­ince of Que­bec. The ad­ver­tiz­ing ban­ner which wraps the re­view sums up the gen­er­al ten­den­cy ex­treme­ly well: “from the­oc­ra­cy to free­dom”. French Can­a­da is a the­oc­ra­cy whose ev­o­lu­tion to­wards free­dom the French re­view Esprit pro­poses to hast­en — why is it med­dling? Last year, a French re­view, Esprit, bore a mas­sive crit­i­cism against the re­li­gious hi­er­archy and na­tion­al in­sti­tu­tions of our prov­ince. It con­tained a ser­ies of ar­ticles writ­ten mainly by this team of young French Can­a­dians who tend to­wards the left, oft­en ex­ceed the lim­its of the truth, are some­times giv­en to ra­tion­al­ism and, in the last few years have bus­ied them­selves with launch­ing gibes against the Church, under the pre­text of re­form­ing it. regard for political allegiance, re­plies in­di­rect­ly to Esprit, with a firm dec­la­ra­tion of prin­ci­ples. **We can see here that whoever was behind the crypto-communist Esprit, and the massive financing used to launch it, Esprit in turn was behind Trudeau and Pelletier’s Cité Libre. so much. The vocabulary borrowed by Cité Libre from Le Jour has in part be­come that of Le Devoir! Cur­rently, in our prov­ince, cer­tain ex­treme­ly queer things are be­ing writ­ten in cer­tain re­views and in cer­tain news­pap­ers and are be­ing said on the air­waves. Civ­il and re­li­gious au­thor­ity is pre­sent­ed as dic­ta­tor­i­al and the en­emy of true cul­ture. Since the whole of the pop­u­la­tion has not yet re­volt­ed, it is ac­cused of wor­ship­ping idols for au­thor­ity and a dread­ful evil is ex­posed, called con­form­ism. While the Pope calls us to her­o­ism and in twenty coun­tries of the world the child­ren of God suf­fer and un­der­go mar­tyr­dom simp­ly for af­firm­ing their faith, here, Cath­o­lics at­tack the Church and its clergy. Ac­cord­ing to them, we are the cause of the ig­nor­ance of our peo­ple and our pas­tor­al and sacer­dot­al ac­tion is a tyr­an­ny. We re­quire our faith­ful to ven­er­ate our de­ci­sions, while the poor find the doors of our pres­by­ter­ies bar­ri­cad­ed by a gutless ad­min­is­tra­tion. These re­marks which we can with­out fear of er­ror qual­i­fy as pure cal­um­nies are de­vel­op­ing in our mil­ieux an un­healthy an­ti­cler­i­cal­ism, which de­taches souls from the Church in an hour when all en­er­gies should be unit­ed and placed into the hands of the head of the Church. Translator’s note: “work­ing to re­form” — that’s the famous word used in Canada to hide the fact they are overthrowing the Constitution — they pretend they are “re­forming” it, when in fact, they are “destroying” it. In constitutional law of Canada — the real law, not the fictitious substitute imposed since the REDS went to work — there is no such thing as constitutional “reform”. The lawful Constitution of 1867 is a permanent, infinite entity that once emancipated from its colonial parent (1931) cannot be removed or replaced. 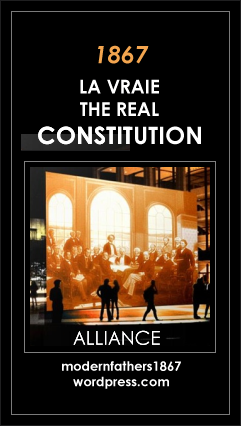 There is no room for the word “re­form” in our constitutional law and literature. It has been introduced by REDS and Rhodes Scholars to hide the fact they are perpetrating high treason. A similar word they also like to use is “re­new”, i.e., “constitutional re­newal”. However, they really mean “coup d’état”, “overthrow”. Le Devoir continues unabated its intensive prop­a­ganda for Esprit and Cité Libre. Ev­ery is­sue of Cité Libre is an­nounced, hailed and ac­claimed in the col­umns of Le Devoir. I said above that Le Foyer, the fam­ily sup­ple­ment of Le Devoir, took note of three re­views, including Esprit and Cité Libre, in its is­sue of June 4th, 1955. Esprit, “is the ham­mer blow which awak­ens us”. And Cité Libre “says things of im­port­ance at a time when they must be known, rais­es ques­tions to­day which any well think­ing French Can­a­dian will be obliged to take in­to ac­count again, one day or an­oth­er”. The lit­er­ary page of Le De­voir of No­vem­ber 19th cur­rent, pre­sents in a very ob­vi­ous frame, a free ad­ver­tise­ment for the new is­sue of Cité Libre. And so on. Le De­voir of June 9th, 1956, for ex­am­ple, con­tains a long com­men­tary on an is­sue of Cité Libre and an ar­ticle on Em­man­u­el Moun­ier, found­er of Esprit. Nei­ther Es­prit nor Cité Libre has changed in the mean­time. The De­cem­ber 1955 is­sue of Cité Libre pri­mar­ily at­tacks “cler­i­co-na­tion­al­ist ideol­o­gy”. President of the Executive Committee of Mon­tre­al City Coun­cil. He sys­te­matically com­bats the pro­vin­cial ad­min­is­tra­tion and sys­te­mat­ic­al­ly sup­ports the mu­ni­ci­pal ad­min­is­tra­tion. He wages a gue­ril­la war against all those who re­sist the left­ist slant. A week­ly, adopt­ing the for­mat of the “sen­sa­tion­al­ist” tab­loids, may at­tain a pas­sion and even take risks hard­ly ac­ces­sible to a daily which is still fol­lowed by a tra­di­tion­al­ist cli­en­tèle. Vrai will do a job which the peo­ple of Le De­voir dare not carry out them­selves. The col­lab­or­a­tors of Vrai, like those of Cité Libre, are or were the col­lab­or­a­tors of Le De­voir. We mean Gilles Mar­cotte and Gé­rard Pel­le­tier. Vrai is print­ed by the print­er of Le De­voir. The left­ist move­ment in French Canada thus pos­ses­ses a full range of pub­li­ca­tions: a daily, a weekly, a mag­a­zine, all quite tight­ly in­ter­twined. Now, ped­a­gog­i­cal bod­ies are need­ed, sus­cep­ti­ble of in­flu­en­cing pub­lic opin­ion via con­fer­en­ces, points of view, ra­dio broad­casts, etc. Le­on Lor­tie is tasked with so equip­ping the left­ist move­ment. Leon Lortie founded the Institut ca­na­dien des Af­faires pu­bli­ques (Can­a­di­an In­sti­tute of Pub­lic Af­fairs) in May, 1953. “Institut Canadien”: this com­mence­ment of the organization’s name will tell some­thing to those who know the his­tory of the Province well*. The Institut canadien des Affaires publiques as­sem­bles in­tel­lec­tu­als of the left. One meets there the per­son­nel we al­ready know: An­dré Lau­ren­deau, Gé­rard Fi­li­on, Gé­rard Pel­le­tier, Pierre-Elliott Tru­deau, Jean-Louis Gagnon, etc. The Institut canadien des Affaires publiques or­gan­izes a few days of an­nual con­fer­ences and dis­cus­sion. It in­vites a French per­son­al­ity of the left — Hu­bert Beuve-Méry, di­rec­tor of Monde, to the first meet­ing, Irénée Marrou, the li­ai­son of­ficer be­tween Es­prit and Cité Libre, to the meet­ing of 1956 — and, to cre­ate the il­lu­sion of im­par­ti­al­ity, a very small num­ber of more or less neu­tral Can­a­dians, deemed to be un­of­fend­ing, sub­merged in a mass of left­ists. Le De­voir com­ments on the pa­la­ver of the Institut canadien des Affaires publiques as if it were a cap­i­tal af­fair. It adds “notes” to the reports. “HON. MR. DORION said that was not the case. The honorable gen­tle­man had misquoted what had passed there. As we have just seen, Leftist Léon Lortie’s “Institut canadien” is named for the meeting place of the old annexationists, pre-Con­fed­er­a­tion. Is Rumilly guessing, or does he know that these Communists and pro-Soviets whose infiltration he is ex­pos­ing, will attempt to merge Canada into the USA and Mexico in the decades to come? And they will do it by seizing control of Quebec to demand that all of Canada adopt the regional system, or Quebec will “leave”. Rumilly’s Leftists have taken the old name of that meeting place for their new or­gan­i­za­tion, aimed not at annexing Quebec to the Republic, but undoubtedly at forming a Communist regional union in North Am­er­i­ca, modeled on that being pushed in Europe by the crypto-communist magazine, Esprit. Rumilly in this pair of books does not write about the regionalizing activities or “federalizing” activities of Esprit in Europe, but that is what Esprit is doing in Europe. It is pushing federalization of the ancient nations: in other words, it is eliminating them. Over fifty years after the Coal and Steel treaties, and the Treaty of Rome, a Soviet-style politburo will almost be in place; and academics such as John Fonte will begin to call Marxist, federal Europe “post-democratic”. However, good reader, the aims of the “Institut” were thwarted in 1867 by Con­fed­er­a­tion; as they will be again! Paul-Émile Gingras notes that the Institut canadien des Af­fai­res publiques, including a good number of professors and discussing the problems of education, exhibits a “negativist spirit, clearly trumping the competence to discuss problems of education”. We will add: it sows one of those storms which harvests the whirlwind. Finally the “Rassemblement” [“Gathering”] is formed, which Le Devoir announces as “a new political movement” and which Vrai acclaims as “a political bomb”, although by Au­tumn of 1956, the organizers deny they are cre­at­ing a po­lit­i­cal party. * Pierre-Elliott Trudeau’s future biography will be entitled “Citizen of the World”. (By John English, a Trudeau fellow traveller in the “Royal Institute of International Affairs” in Canada. ** In 1965, the Marxists in power will take back Quebec’s con­sti­tu­tion­al power over Edu­ca­tion, which has been left with the Cath­o­lic Church since 1875. Sher­brooke Uni­ver­sity at its web site notes that in the mid 1960s in Quebec, a popularized form of Marxism began to be taught in the schools. Teachers from France were imported for the purpose. In addition, I would observe that the communist goal of “mul­ti­cul­tur­al­ism” — the merging of the world’s populations to remove national boundaries, could not have been done in French Catholic Quebec, where the only alternative public educational system was the Protestant School Board. The confessional school system, and in particular the Catholic educational system designed to preserve traditional French-Canadian culture, was thus a total barrier to mass immigration of 200+ foreign peoples onto Quebec soil to create de facto multiculturalism. That barrier went when the Marxists took Quebec, and using tactics perfected by Esprit in France, invaded the Catholic Church and government, and took down both from within. *** Jacques Parizeau’s first wife, a Pole, will write for Cité Libre. One of her articles recommends routine State inspections of family homes to verify parents’ child-rearing capabilities. The Rassemblement, presided over by Pierre Dansereau, comprises the usual team: An­dré Lau­ren­deau, Jacques Hé­bert, Gé­rard Pel­le­tier, Pierre-Elliott Trudeau and so on. At first sight, the Rassemblement and the Institut canadien des Affaires publiques are doing double duty. In fact, they are complementary, they help one another. Pierre Dansereau, president of the Rassemblement, becomes vice-president of the Institut canadien. At the opera, to produce a crowd scene, the director has the same cast parade by the audience several times. Is that the aim of the members of the Institut Canadien when they also form the Rassemblement? If the Institut canadien des Affaires publiques and the Rassemblement protest, as if by chance, at the same time, to the same end, in a given sit­u­a­tion, a big­ger effect will be produced than if the team of Lortie-Laurendeau-Filion-Hébert-Pelletier-Trudeau had just one group. The fact remains that here is our network, almost complete: Le Devoir, Cité Libre, Vrai, l’Institut canadien des Affaires publiques and the Rassemblement. Apart from Le Devoir, which owes what remains of its prestige to a tradition it disavows, all seems grey and flat; after all, financial means are limited. The in­ter­ven­tion of a pow­er­ful or­gan­i­za­tion — powerful because it lays out tax­pay­ers’ cash — will pro­vide sub­stan­tial aid to the ring. Opinion is manufactured, today, like au­to­mo­bile parts, in ser­ies. Ev­ery press agent, and even more, every prop­a­ganda agent, knows the in­flu­ence of skill­fully biased pro­gram­ming. The leftists know it. The cinema and espe­cial­ly radio are among the fields where pen­e­tra­tion and col­on­i­za­tion by Com­mu­nists is most advanced, and where they have the great­est con­se­quences upon mor­als and pol­i­cies. In Canada, the Liberal party, on the left, as ack­nowl­edged by Edmond Tur­cotte, always had an advanced wing, a rad­i­cal wing enjoy­ing a dom­i­nat­ing in­flu­ence with­in the par­ty. The Lib­er­als’ press was en­trust­ed suc­ces­sive­ly to Hon­oré Beau­grand, Gode­froy Lang­lois, Jean-Charles Har­vey, Ed­mond Tur­cotte and to­day, to Jean-Louis Gagnon*. Radio and film hav­ing be­come equal­ly pow­er­ful in­stru­ments of ac­tion, in fact more pow­er­ful than the press, the Lib­er­al party, with its grip on the fed­er­al State, has stuffed the Film Board and Radio-Canada with left­ists. *Translator’s note: Jean-Louis Gagnon is exposed by American author Allan Stang in CANADA – How The Communists Took Control (April 1971). Gagnon was a Soviet spy who my further reading shows, fled Canada to Brazil with the help of (future) Trudeau advisor Mitchell Sharp, to avoid the trials taking place after the Gouzenko spy-ring revelations of September 1945.
of espionage, a number of John Grierson’s friends, com­menc­ing with his own secretary, Freda Linton, whose real name was Freda Lipschitz (a Polish Jew), were charged. Even John Grierson’s name is mentioned at page 486 of the commission of inquiry’s report. As I am writing this, a federally appointed Com­mis­sion of in­quiry is un­der­way on ra­dio broad­casting. The French-Can­a­dian com­mis­sioner is none oth­er than Ed­mond Tur­cotte, friend of the Reds in Spain — and ev­er­y­where. Ed­mond Tur­cotte has no par­tic­u­lar ex­per­tise on the sub­ject of radio, but his Red­ness is guar­an­teed. Jean-Louis Gagnon, who must rec­og­nize him­self here­in, asked him in an open let­ter in 1936: “Why do you con­tin­ue to write for a bour­geois rag when you are frank­ly com­mu­nist?” (La Nation, May 7th, 1936). I beg my read­ers to weigh this fact: the Lib­er­al par­ty has al­ways giv­en its press, and then its film and radio, which is to say the in­stru­ments cap­able of form­ing opin­ion, to rad­i­cals, to the most ad­vanced Reds one could find in the coun­try. Libre–Vrai–Institut canadien des Af­fai­res pu­bli­ques–Ras­semb­le­ment. And to begin, the pilgrims of Communist Poland, China or Rus­sia were wel­comed, ex­hib­i­ted, cel­e­brated, ad­opt­ed by Ra­dio-Canada — by tel­e­vi­sion in par­tic­u­lar. It is suf­fi­cient to have been the guest of a Com­mu­nist gov­ern­ment to be in­vited and re-invit­ed to the mic­ro­phones of Ra­dio-Can­ada. On Communist accomplishments in Poland, Jacques Hébert gave a tel­e­vised inter­view which caused a scan­dal (12 De­cem­ber 1955). Cath­o­lic news­pap­ers pro­test­ed. Pol­ish Cath­o­lic ref­u­gees in Can­a­da — in­clud­ing jour­nal­ists, pro­fes­sors, form­er min­is­ters, for­mer am­bas­sa­dors — de­mand­ed equal time from Ra­dio-Can­a­da for their side of the story. They were en­dorsed by a vig­or­ous wave of opin­ion. Léo­pold Ri­cher asked, in Notre Temps — at that time pub­lished by a cor­por­a­tion con­troled by the Fath­ers of the Holy Cross : “When are we going to hear Pol­ish Cath­o­lics on the tel­e­vi­sion?” Ra­dio-Can­a­da had no choice but to or­gan­ize a press con­fer­ence for Mr. An­dré Rus­kow­ski, Sec­re­tary Gen­er­al of the In­ter­na­tion­al Cath­o­lic Of­fice of Cin­e­ma to be heard. at Radio-Canada. And Jean Vin­cent had the same fa­vour in the same way. I will insert an anecdote. My readers understand that I do not at­tack peo­ple, but their ac­tions, their harm­ful ide­as. Among the jour­nal­ists, the in­tel­lec­tu­als and the ra­dio pre­sent­ers named here are men whom I know, oth­ers I have never met. There are those with whom I have had cour­te­ous deal­ings. Some of them may be as sin­cere as I am. It is their ideas, once again, which must be de­nounced and com­bat­ted. But it is quite ne­ces­sary to name the people who prop­a­gate these ideas. I do so with­out hat­red, with­out ani­mos­ity even, and in sev­er­al cases with real sorrow at the thought of the tal­ents that a dis­as­trous cur­rent is draw­ing into the service of evil. One will not find here the counter­part of words em­ployed by Gé­rard Fi­li­on in con­nec­tion to me and with re­gard to the oth­er de­fend­ers of French-Can­a­dian tra­di­tions. Cer­tain be­hav­iours have no cur­rency among us. So, we were men­tion­ing Jean Vincent, the young sen­ior edi­tor of L’Autorité, a rad­i­cal sheet. Jean Vincent re­turns from a trip to China and to Mos­cow. (At whose ex­pense? L’Autorité is a paper with no cir­cu­la­tion.) Radio-Can­a­da im­med­i­ately in­vites him to give a tel­e­vised press con­fer­ence (February 25th, 1955). Jean-Louis Gag­non, as if by chance, di­rects the show; and Jean Vincent ex­hib­its a very clear gen­er­al in­cli­na­tion in favor of the com­mu­nist coun­tries. That is enough to launch Jean Vincent onto Radio-Can­a­da’s circuit. Television is, by way of certain of its programs — Carrefour, Conférence de presse, Les idées en marche [Ideas on the move], amongst others — a veritable public university. At certain hours, it reaches nearly half a million French-Can­a­di­an viewers. However, draw up a list of the most ten­a­cious par­ti­ci­pants. You will record Gérard Pelletier, André Laur­en­deau, Gérard Filion, Jean-Louis Gagnon, Jean-Marc Léger, Pierre-Elliott Trudeau, etc. Men of the right are the majority among the French Can­a­di­ans, as among the French Catholics. How­ever, count the ap­pear­ances of men of the right and those of men of the left on Radio-Canada, and com­pare! One of the prin­ci­pal left­ists at Le Devoir, Gilles Marcotte, feels obliged to re­sign at the time of the strike (or the lockout). Radio-Canada fishes him out at once, and makes him di­rect­or of cul­tur­al pro­gram­ming. Gérard Pelletier directs the show “Les idées en marche”. The appointed commentators are leftists — and some of them are quite advanced — practically, the lot. taxpayers: cash-cows, prestige and the means of propaganda. Question: Would Radio-Canada offer so much en­cour­age­ment and so much cash to Laurendeau and Filion had Le Devoir remained the nationalist newspaper of Henri Bourassa and Georges Pelletier? More cynical still. The annual meetings of the Institut can­a­dien des Affaires publiques are organized with the assistance, both moral and financial, of Radio-Canada. It is with the mon­ey of Radio-Canada, i.e. with the mon­ey of all the tax­pay­ers, that Léon Lortie, Gé­rard Pel­le­tier, And­ré Laur­en­deau, Jean-Louis Gagnon, Pierre-Elliott Trudeau and their friends can indoc­trin­ate the pub­lic! Finally, the Rassemblement has barely been created when Radio-Canada invites its president onto the television — and gives this leftist movement brilliant publicity. My friends and I, eager to set up a dam, to the extent we can, have created the Centre d’Information Nationale (the National In­for­ma­tion Center), and have requested the same favour from Radio-Canada. Our strict right as cit­i­zens, as tax­payers. It was very difficult not to grant our request: and it was granted. A grouping on the right may obtain the small al­lot­ment sufficient and necessary to make it possible for Radio-Canada to pretend impartiality: “But, you as well, we invited you, too.” Noone imagines Radio-Canada financing the study days of the Centre d’Information Nationale. to foreign visitors. Albert Béguin, di­rect­or of Esprit***, is not able to come to Can­a­da un­less Ra­dio-Can­a­da runs after him. Its lat­est press con­fer­ence, man­aged by René Lé­vesque*, brings to­geth­er Gé­rard Pel­letier and Jean-Marc Léger at his side. At the same time, a rath­er em­i­nent French Cath­o­lic, since he is the pri­vate chamberlain of His Holiness, and even vice-pres­i­dent of the French cham­ber­lains, was also in the prov­ince of Que­bec. Radio-Can­a­da could not fail to know it, as Mr. de La Fran­que­rie had giv­en con­fer­enc­es, and re­ports had been pub­lished in the press. The friend who had or­gan­ized the trip of de la Fran­que­rie had more­over, some time in ad­vance, so­li­ci­ted the di­rec­tor of pro­gram­ming of Ra­dio-Can­a­da. Ra­dio-Can­a­da had no time avail­able for him. Ra­dio-Can­a­da had time for Mr. Béguin, a Cath­o­lic of the left, but not for Mr. de La Fran­que­rie, a Cath­o­lic of the right. It does occur that a man of the right is in­vit­ed onto the tel­e­vi­sion, but he is care­ful­ly flanked by two men of the left. And as the show host him­self is a left­ist, the man of the right runs ev­ery risk of be­ing ne­glect­ed, iso­la­ted, cut off, out­classed. Not to men­tion that the left­ists thus ac­quire a fa­cil­ity, a real pro­fi­ciency in tel­evi­sion, the oc­ca­sion for which is de­nied to others. Practically every discussion, practically every con­clu­sion, is thus di­rect­ed to the left. *Translator’s note: René Lévesque is a communist; his father raised him as a communist. Thus is the mind of of the French Canadians worked upon. Radio-Canada completes and has been supporting the leftist network set up in our province in the last few years. It is unconstitutional already that the Federal state mon­op­o­lizes a sec­tion of education — a domain reserved to the prov­inces — which it does by the in­ter­po­si­tion of Ra­dio-Can­a­da. The courts have rec­og­nized to the Fed­er­al state the right to reg­u­late the use of the air­waves. They have not con­ced­ed to it any right of pub­lic edu­ca­tion. Ra­dio-Can­a­da, the cor­por­a­tion, such as it func­tions, is il­leg­al. It is doubly in­tol­er­able that French-lang­uage State ra­dio and tel­e­vision, liv­ing off pub­lic funds of the French-Can­a­dian peo­ple, seek to drag them to­wards an ide­ol­ogy con­trary to their own tra­di­tions and their na­tion­al as­pi­ra­tions. Jean-Marc Léger left the intention of the leftist group to highjack L’Action Nationale to inference. Translator’s note: Allan Stang in 1971 would call it “The Ring in Operation”, and frankly, so would I. But I’m trying to adopt Mr. Rumilly’s language and his style at the time. Generally, our young leftists conceived the idea of taking over from the inside a collection of groups or organizations na­tion­al­ist in tendency. With Le Devoir, they already possessed a newspaper, nationalist in tradition. Jean-Marc Léger seemed to be the lynchpin of the “Action Nationale” operation. André Laurendeau largely facilitated his job for him. Initially, it was thought to await the death of Canon Groulx, whose in­flu­ence remained dominating. Then they would storm in and take over. A significant number of directors of L’Action Na­tion­ale rarely if ever attended the meetings. I could name one director capable of blocking the leftist takeover, to whom meeting notices — through over­sight, no doubt! — were not al­ways sent. Lastly, meetings were often held at André Lau­ren­deau’s house, which added weight to this director, the host of his colleagues. In short, they would bring in young directors from the Cité Libre group, a number of whom had no claim to be there — no claim but their leftism. In the end, the leftists would be the most persevering and active at meetings, if not the most numerous in theoretical strength. L’Action Nationale was for all intents hijacked. Translator’s note: André Laurendeau‘s is an extremely important name, which Rumilly in 1956 has allowed us to add to the list provided by Allan Stang in 1971. André Laurendeau is so far Left that during the so-called “Royal Commission on Bilingualism and Biculturalism” on which he sits (a sham commission stuffed with Reds hidden in plain view behind one Catholic priest chosen for that effect), Laurendeau is hosting in his home basement none other than two “former” men of Cité Libre, Pierre Vallières and Charles Gagnon, who will imminently become the well known leaders of the F.L.Q. terrorists who started their bombing campaign in early 1963 in Montreal. The two are launching an ultra-radical Marxist sheet in Laurendeau’s basement, to which Laurendeau’s son and a couple of La Presse newspaper journalists under pseudonyms will contribute articles. Laurendeau is an Editor of Le Devoir, a formerly French-Canadian nationalist publication, taken over by a leftist ownership; thus, we have two contaminated major Quebec daily newspapers at the time the Marxist FLQ terror is going on! Vallières and Gagnon both worked at Trudeau’s Cité Libre; in fact, they met there. 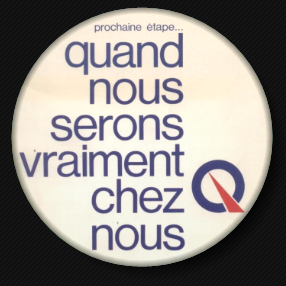 Both men leave Cité Libre to lead the FLQ; my suspicion is that their mission was to re-orient the FLQ towards acceptance of René Lévesque’s plan for Canada, “Sovereignty Association”, which is not Quebec “sovereignty”, but is actually the intended basis of regional union, the North American Union. In any event, the far-left Laurendeau is fraternizing with “future” terrorist leaders while sitting on a sham “royal commission” appointed by none other than soviet spy, (de facto) Prime Minister Lester Bowles Pearson. There is thus a direct channel open between Pearson and the “future” terrorist leaders, through the royal commission. Which is not to say it’s the only channel; but merely to illustrate the level of Communist contamination at Canada’s federal level while “terrorism” was loose in Quebec, seeking “secession” which was really a front for “negotiating” the top-half of the continental North American Union with the “rest of Canada”. These tight links do suggest that Lester Pearson and the leftists were in a position to orchestrate “designer” terrorism to suit their own political objectives. different purpose — to defend the rights of the French Canadians. When Father Braun denounced Pierre-Elliott Trudeau, after his voyages behind the iron curtain, André Laurendeau precipitated the Action Nationale to the rescue of Trudeau. Two articles were devoted to this task. Two articles impassioned in tone. But, let’s not discuss the respective texts of Trudeau and Father Braun. Let us only note that Trudeau did not publish his articles in the Action Nationale and is not a member of the National Action League. Where is the very pressing need for the Action Nationale to rush to his defense? The reader will pardon me for taking myself as an example, but I believe this is valid: if I were at odds, or if any other Canadian who shared my opinions was at odds with Father Braun or with any other adversary, would André Laurendeau mobilize the Action Nationale for our defense, even if we were right, ten times over? Even though we, my friends and I, are, in contrast, faithful to the nationalist tradition that the Action Nationale has for so long defended, in fact personified! members of the National Action League, which name appears — like a guarantor — on the cover of the review and who, though given no notice, appeared to endorse their gesture. The situation is even more grave when one touches on principles, as if Jean-Marc Léger has none. Jean-Marc Léger in the Action Nationale expresses the hope to see emerging “a socialist State of Quebec”*, even if, to attain it, it is necessary to run up “against the combined forces of cowardice, political incorrectness, clericalism and treason, with the forces of darkness acting under the banner of prudence and realism”. Fernand Dansereau justifies class consciousness, in short, he recommends class struggle. He glorifies a march on Quebec organized by the trade union federations, as “a net appeal to class consciousness”. “For the first time,” he says, elated, “in the history of the province, a crowd composed only of workers took to the street contrary to the liking of police”. * In fact, the Parti Québécois, led by René Lévesque, but in fact set up at the instigation of Trudeau, Pelletier and other leftists of the Pearson federal government, in a secret committee of Power Corporation of Canada in Montreal in 1967, published its “manifesto” in 1972. The document, produced in French only, with not even an English draft in official archives, proposed a totalitarian government to run the economy, centralized production, the virtual obliteration of private business, and a self-managed work-force, all on the model of what Charles Perrault, then of the Conseil du patronat identified as the kind found in “socialist countries” such as Yugoslavia, Czechoslovakia and Poland. I have a 13-minute radio show in which Perrault makes that statement; I’m translating the show. I will eventually make a copy of that translation and the Parti Québécois’s “communist manifesto” available. It was with this form of government in mind that Lévesque planned to link up to Canada in common supranational institutions, on the model of the European Economic Community, and then the European Union. The merger of the “rest of Canada” and communist Quebec through common institutions on the EEC-EU model, would have created the top half of a continental, regional union. We’re seeing that union emerge today after 9/11, as the North American Union. Pauline Marois is the current leader of the Parti Québécois, who is now a billionaire, was in René Lévesque’s cabinet in 1976, intending to implement this “communist manifesto” after a Yes in a referendum. Since at least 2007, Marois keeps saying in French that Quebec is going to become an “état social”. I would suspect this is her deceptive way of saying an “état socialiste”. / translation ends here. Sorry! Stay tuned. I will let you know when the whole book is ready. Meanwhile, you may enjoy a few words about Robert Rumilly, his views on socialism, and his personal background. Born in Martinique, educated in Indo-China and in France, Robert Rumilly was the first to tra­verse many dis­tan­ces in the his­tory of Can­a­da. A par­tic­u­lar­ly ac­tive and en­er­get­ic his­tor­i­an, he left a ma­jor body of work, in­clud­ing his vo­lum­i­nous His­toire de la pro­vince de Qué­bec. Ro­bert Rum­illy also pub­lished biog­ra­phies of Louis-Joseph Pa­pi­neau, Mau­rice Du­ples­sis and Hon­ore Mer­cier. His biog­ra­phy of Hen­ri Bou­ras­sa re­mains unequal­led to date. I knew the harm these con­cepts and these di­vi­sions cre­at­ed in France. I want­ed to spare French Can­a­da, my adop­tive home­land of 30 years, which I love pas­sion­ately, from this harm. I wrote and pub­lished “The Left­ist In­fil­tra­tion of French Can­a­da” (L’In­fil­tra­tion gau­chiste au Ca­na­da fran­çais) ex­press­ly to de­nounce the in­tro­duc­tion to French Can­a­da of the French con­cepts of right and left and the at­mos­phere of ci­vil war which they cre­ated. I in­vite all the skep­tics to read this lit­tle book. They will note that from one end to an­oth­er I do noth­ing but de­plore and combat the im­por­ta­tion, by the left­ists, of an ex­ec­rable French in­flu­ence. Nationalism is a nuance, or if you wish, a comp­le­ment of pa­tri­ot­ism. The vir­tue of pa­tri­ot­ism is the attach­ment to one’s na­tive soil, to the land of the an­cest­ors. Na­tion­al­ism em­braces rather the moral and spir­i­tu­al her­i­tage; it is sooner the attach­ment to men, our broth­ers, with whom we share this her­i­tage. It is the fam­ily spir­it ex­tend­ed to the na­tion. It is super­flu­ous to show that na­tion­al­ism does not im­ply any hos­til­ity to­wards the other hu­man groups — any more than fam­ily spir­it leads to hat­red of the neigh­bour­ing fam­i­lies. It im­plies only a dis­tinct, pre­ferred love. However, the Left seeks to substitute class con­scious­ness for na­tion­al spir­it. – Robert Rumilly, writing in his L’infiltration Gauchiste Au Canada Français, 1956, p. 114-115 (The Leftist Infiltration of French Canada). By sys­te­mat­ic­ally giv­ing pow­er to the work­ers and peas­ants, one elim­i­nates little by little the middle-class in­tell­ec­tu­al, that king of the ar­ti­fi­cial and ab­stract world in the midst of which we live – we, the civ­i­lized. In re­serv­ing to them, in pref­er­ence over all others, the rights to edu­ca­tion, so­cial wel­fare, and then man­age­ment of the com­mu­nity, one yields to them, little by little, scie­nce and civ­i­li­za­tion. That in­ev­it­ably from this, a per­i­od of stopp­age, of back­ward­ness and re­gress­ion foll­ows, is in our view of no im­por­tance. The goal is achieved; the her­i­tage of hu­man­ity pass­es into oth­er hands. – Jean Sylveire, writing in “Communism devant l’Occident — Contre ?” (Communism confronting the West — Against?) in the the first issue of the French cryptocommunist review Esprit, published in France in October 1932. Mr. Rumilly’s volume, The Leftist Infiltration in French Can­a­da contains no Table of Contents. I have therefore com­piled one for convenience. Nota bene: As of 5 January 2014, I have translated two chapters. I’ve done Chapter I, «The Catholics of the Left in France”, which gives you the background to Esprit, a pro-Soviet, cry­pto-com­mu­nist, “left Cath­o­lic” mag­a­zine in France which Pierre Tru­deau and his col­league Gé­rard Pelle­tier and oth­ers de­cided to em­u­late in Ca­na­da by found­ing Cité Libre in 1950. And I have done chapter III, “The Leftist Network“, in which Rum­illy lines up the key groups, news­papers, and or­gan­i­za­tions founded or co-opted by the pro-Com­mu­nist ring, which in­cludes An­dré Lau­ren­deau, and a cast of oth­ers.